strongUNV40304/strongBR/Universal 40304 Letter Size ClipboardsBR/High-capacity clip lets you get a grip on large stacks of paper. Durable construction. 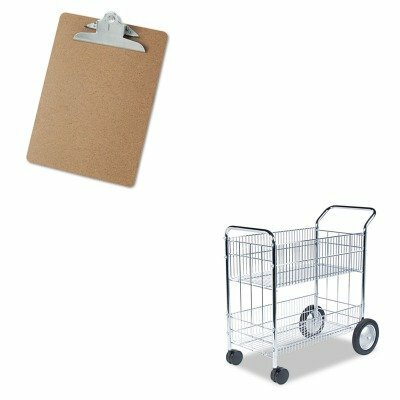 Holds Paper Size: 8 1/2 x 11 Clipboard Actual Size: 9w x 13h Clipboard Material: Hardboard.BR/BR/strongFEL40912/strongBR/Fellowes Wire Mail CartBR/Top basket sorts by letter or legal size hanging folders. Bottom basket for bulk mail or packages. Heavy-duty steel wire and tubing frame. Color: Chrome Caster/Glide/Wheel: Four 4quot; Front Swivel Casters, 10quot; Rear Wheels.